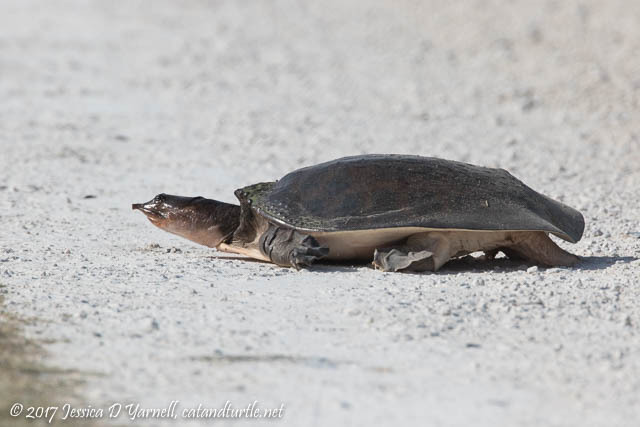 Well, my Memorial Day morning visit to the Lake Apopka Wildlife Drive was so great that I had to go back in the afternoon! Even better, I called my dad and he came with me. Our target was the Fork-tailed Flycatcher, who will get his very own post (soon, I promise!). We saw lots of other good birds, too. Come enjoy it with us! It was my first afternoon visit to the drive. It was hot. Yep, it’s definitely summertime in Florida. The birds were not nearly as active as they are in the morning. I roll the windows down so I can listen and find birds based on their song. In the afternoons, they are a lot quieter. 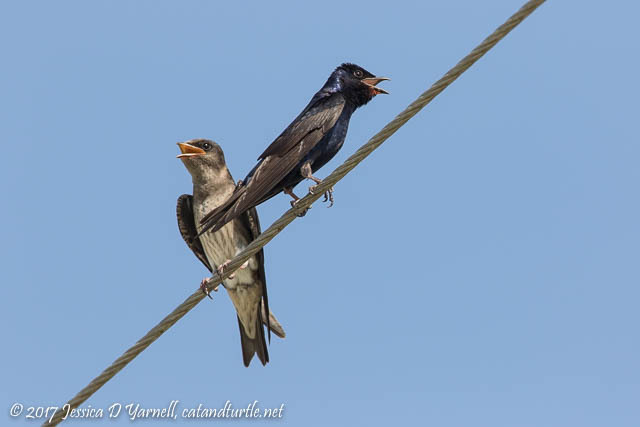 We spotted these Purple Martins on the power lines on Lust Road, and they had their mouths hanging open, trying to stay cool. I was on the lookout for Red-winged Blackbird nests with small chicks. I saw lots of cup nests out in the open, but nobody seemed to occupy them. I guess I was a few weeks late? Or Mom was just nestled down tight. 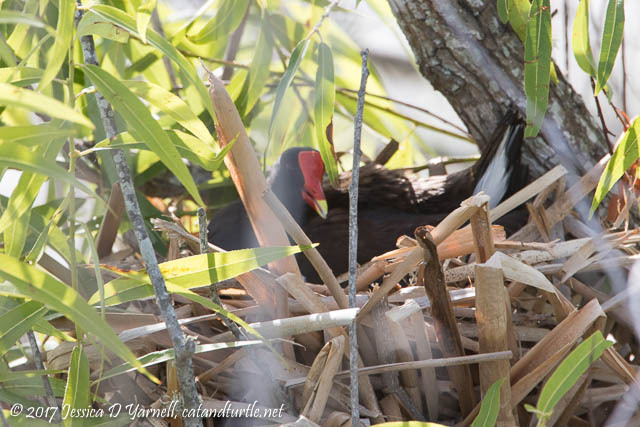 We did spot this Common Gallinule on her nest. I’d never seen that before. I see plenty of alien chicks, but not all the patient waiting that goes into the incubation process. 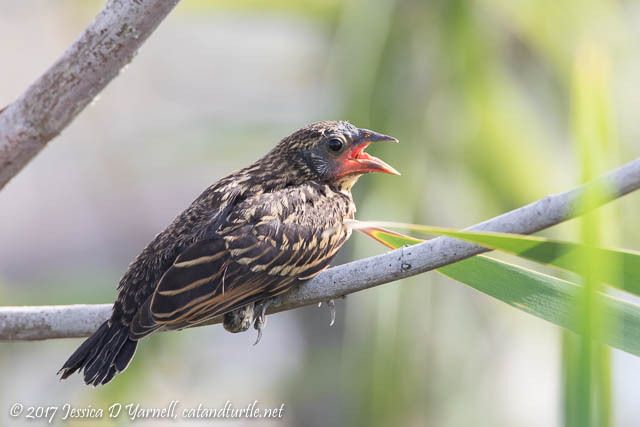 Speaking of Red-winged Blackbirds, we turned a corner and saw a few fledglings near a nest. They pretty much sat on the branches and squawked for food. They were sure cute, though. Mom flew in and did a quick insect pass with this baby. It’s hard work keeping up with all these kids! 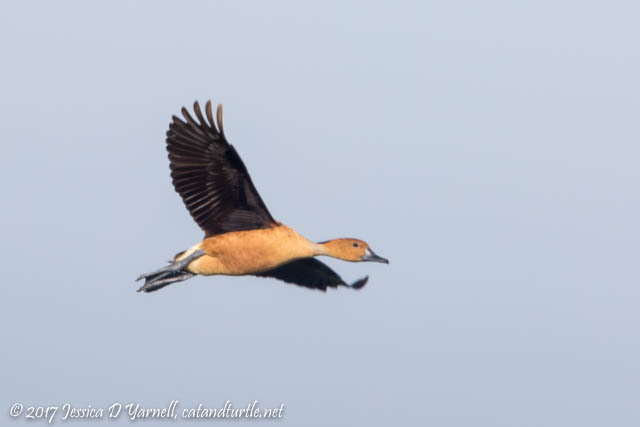 Fulvous Whistling-Ducks were flying all over the place. I’m starting to better recognize their calls. They were closer than the Fulvous whislers at the Lake Hancock Outfall Wetlands a few years ago. 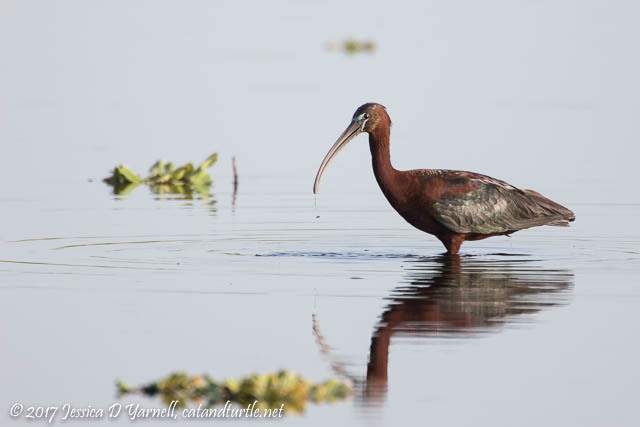 Ready to see a local celebrity bird? 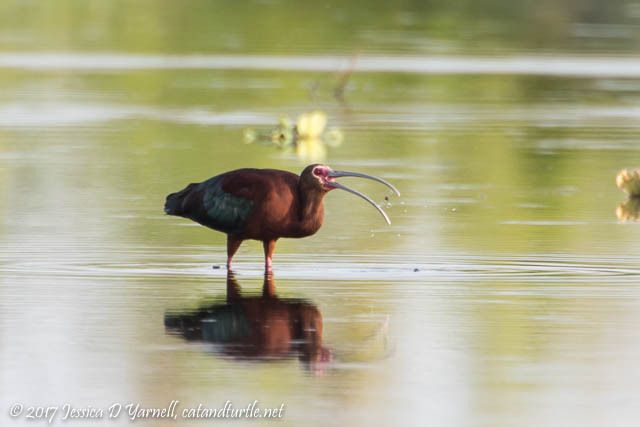 Our next stop was the Interceptor Pond where a rare White-faced Ibis had been sighted the previous day. The normal range for this bird is the western half of the US, but a few vagrants show up in Florida from time to time. I started scanning the pond with my binoculars, hoping that my dad would score his lifer. Bingo! There was the bird, with the red on his face and the white line around it. He was pretty far out. I didn’t realize that I had caught a picture of his dinner until I got the photos onto the computer. The allure of the Fork-tailed Flycatcher compelled us to leave the ibises long before we really wanted to. 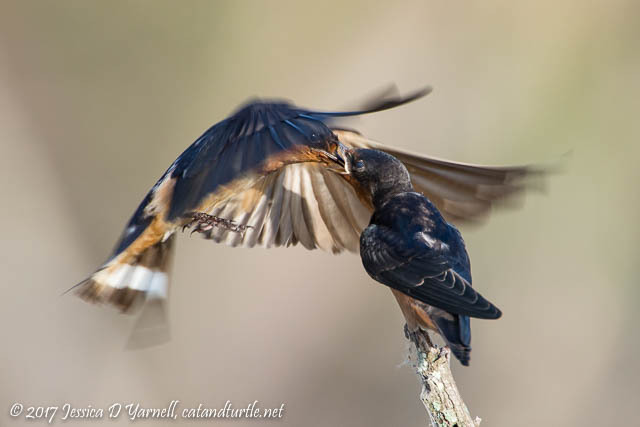 Then we spotted the Barn Swallows on the side of the road. As you’ll recall from my previous post, I’m hopelessly addicted to cute Barn Swallow babies. My dad was ecstatic to get pretty close to them. In the few moments that we spent with them before we were overcome by insects, I managed to snap this…it was total luck that I was focused on the right baby at the right time! Finally we made it out to the sod farm where the Fork-Tailed Flycatcher has taken up temporary residence. We kept begging him to come in closer, but he was very happy catching insects far, far away from our lenses. Yes, there is such a thing as being too far out – even for the Beast! 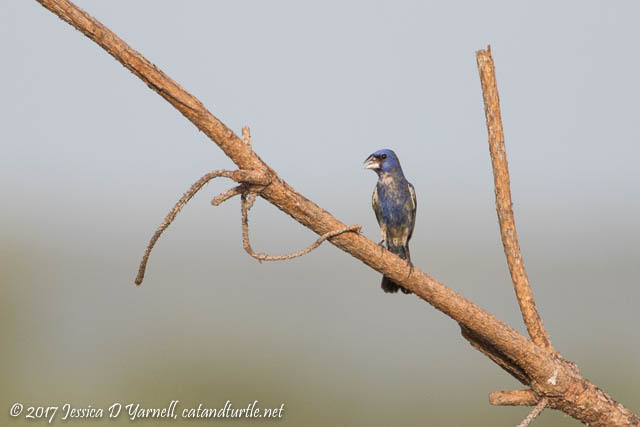 This little Blue Grosbeak hopped up in a nearby perch, the same one that I was mentally begging the flycatcher to occupy. Not a bad consolation prize…and he did sing for us…but he definitely inspired a return visit to see the flycatcher. More on that coming soon!